Edited by John Morrow Jack Kirby Collector celebrates the life and career of the "King" of comics through interviews with Kirby and his contemporaries, feature articles, and rare & unseen Kirby artwork. Now in tabloid format, the magazine showcases Kirby's art at even larger size. 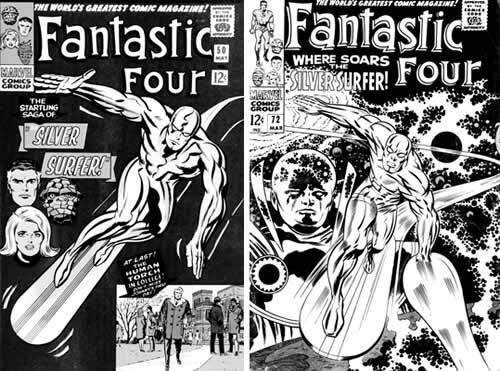 I've often marvelled at the differences between the Silver Surfer figures on the covers of FF #50 and #72. Both are virtually pinups-both are of the same character and both are by King Kirby. But the first is a lithe, sinuous figure who is strong yet fluid. The second is shiny granite. Somewhere between May 1966 and March 1968-the cover dates of these two issues-Kirby's way of drawing the human figure had changed. But something else had changed too. One of Kirby's greatest and most lasting creations/discoveries had appeared-the spectacular and affectionately called "Kirby Krackle." That cover of FF #72 is alive with it. Galaxies are formed out of it. Energy seething and rising is formed out of it. Little black dots in wonderfully evocative patterns make the cover feel electric! A quick look through the issue shows over half the pages have at least one panel on them using Kirby Krackle to represent anything from space to naked power to smoke to explosions to the energy surrounding teleportation. Kirby obviously loved it and thought it expressed these elements of his story well. I think we all agree there. Go back three years to FF #37. A space adventure with a cross-galactic voyage, the first Marvel age warping through Sub-Space, lots of action and explosions and battles. And something else, noticeable by its absence-not a single use of Kirby Krackle anywhere. So it seems somewhere, in the three years between FFs #37 and #72, Kirby created/discovered the power of simply arranging black spots to achieve an illusion of power even greater than he or anyone else had achieved before. So where did it all begin? Looking at the FF issues subsequent to #37, the first time I see something that begins to look vaguely like Kirby Krackle is during Ben Grimm's battle with Dr. Doom in FF #40. But it isn't really the Krackle at all. Common place in comic explosions were the heavy 'flash' lines indicating the lines of force and the heavier, 'smokey' ends on them. Kirby being Kirby drew them heavier than most others and made the explosions look stronger. There are numerous examples here. Also on page 19 panel 3 we see a semi-silhouetted Thing as he struggles against Doom's power. Some of his outline is missing, suggestively hidden by Doom's flashing power, but again, it's not Kirby Krackle as such. It's an example of how Kirby rarely if ever used subtle grading in any of his drawings but instead opted for full black or clear white-a characteristic of his that no doubt was foundational in how and why he was able to discover his Krackle. The first tentative steps toward Kirby Krackle, not quite fully evolved, from FF #40 (July 1965, pg. 19) and #46 (Jan. 1966, pg. 16). Jan. 1966-FF #46: The FF are full swing into their first meeting with the Inhumans. In it, Black Bolt's antenna smolders, the Torch blasts through walls, Gorgon thumps things and there's action everywhere. Lots of flashes and explosions and stress lines. But no Krackle. The concurrent Thor issues have Loki and the Absorbing Man in sequences with huge battles, Asgardian scenes and time travel. No Krackle here either. 'Smokey' explosions sure, but no Krackle. But it's after the fight, on page 16 of FF #46, that we do get the first real hint that I can see that Kirby Krackle isn't far away. There, in the first panel is Triton in his watery prison. His body is partially obscured in the fluid. How? Not with the usual cross hatching, but with black dots. It's not much, but perhaps something was sparking the King's mind. March 1966-FF #48: Page 7 and 8 have the first ever shots of the then-new Silver Surfer. And there, in the space scenes, the smoldering Universe is partially drawn in black dots. Then on page 13, there it is again. Panel 4 shows an explosive Universe behind the Surfer. 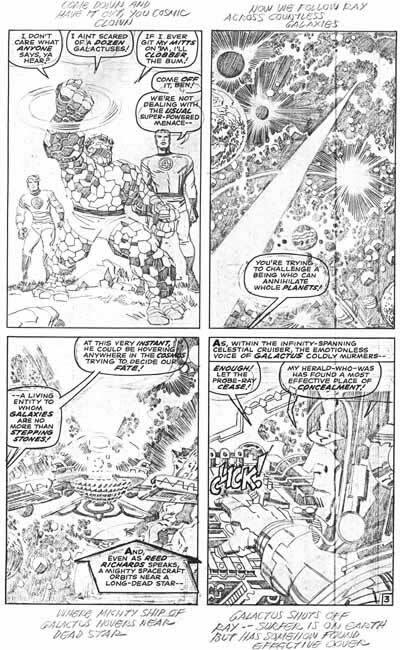 And in panel 5 (shown at left), we see him 'surfing' the Krackling shock waves of the explosion-the first real use of Kirby Krackle, and in such a landmark issue as the first Surfer/Galactus issue. Amazing-Kirby was inspired! The concurrent issue of Thor was #125. (Note: As any true '60s Marvel fan knew, Thor, the Avengers and a few others were 'out of sync' with their cover months. Though Thor #125 was cover dated February, it was opposite FF #48-dated March-in the checklist. This discrepancy wasn't rectified until Nov. 1971; and why my mind keeps such essential details in its memory bank is beyond me.) Did it have any Krackle? Maybe. For the first time, it looks like the space surrounding Asgard in a panel on page 7 is Krackly. April 1966-FF #49: On page 5, black smoke pours off the Torch-probably smoke as it's always been drawn rather than the new Krackle-but it looks great and full of Kirby power. Page 12 has the first apparent use of the Krackle to show power and energy on a smaller scale than a space backdrop. As Galactus' machine hums into life, the Krackle dances and flickers around it. Kirby must have realized-it worked great. Page 16 was again a space shot. On the righthand side is swirling galaxy, composed mainly of black dots in Kirby's new way of representing the cosmos. Top left is another space swirl-but one which has no black dots. This one doesn't hold a candle to the other and Kirby must have seen this as he drew them less and less as the power of the Krackle took over. I said FF #49 page 12 had the first 'apparent' use of Kirby Krackle at 'small' level. Why apparent? Because Thor #126-same month (despite the cover)-also has it and maybe this was drawn earlier. 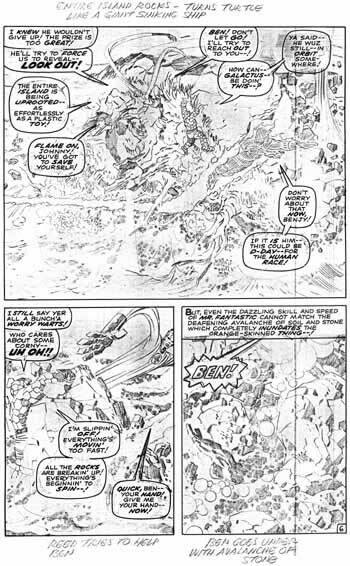 Page 3 shows Odin silhouetted with power crackling around him, and page 10 shows Seidring's hand crackling with energy, Krackle style. For the first time, Kirby Krackle dances and spits around a character's hand. Kirby still hadn't fully come to grips with his new toy, though. Every time he employed his Krackle, it was against a shadowed background. When in full light, the Krackle disappeared and energy was shown the old way with wavering, stress and flash lines. Still, April 1966 was a watershed month. Pencils from FF #75 (June 1968), page 3, showing full-blown Kirby Krackle. Characters © Marvel Characters, Inc. The next month, FF #50 takes the concept a little further. On page 2 when Galactus is showered in energy from the Surfer, he is shown awash in Krackling dots. No dark or space background here. When Johnny reappears from the void, he does so in a sea of Krackle out of the darkness. But when Galactus finally departs, he does so amidst flashing lines and some Krackle. Again, it is not dark, but Kirby makes it so for the dramatic effect. The Krackle is coming into the light. Over the next months, it is similar. Thor #127 has a few examples. Every so often, Kirby uses his new, powerful discovery. As of October 1966, Kirby seems to decide his wonderful Krackle serves his purposes better than any other. The deciding factor is the return of the Silver Surfer in FF #55. Again, the concept of this being of immense power from the stars ignites Kirby's imagination and his penciling abilities do not let him down. Suddenly, Kirby Krackle is everywhere as the Surfer and his board glow and sputter and seethe and writhe with barely contained energy. It seems as if Kirby was from then on unable, or unwilling, to show any power packed fight scene with anything less than the high octane excitement that his krackling black dots could create. Kirby's other books swiftly _follow suit. The Red Skull's use of the cosmic cube in the same month's Captain America is ably depicted by generous _helpings of Kirby Krackle. The following month's Thor saw Kirby Krackle 'glowing' around Ego's humanoid form (lots of dots instead of the normal radiating glow lines), and in great symbolic form, the Recorder is shown with his body full of Krackle to show the energy he is using to record Thor's amazing battle. From then on, it was Kirby Krackle all the way and no Kirby book ever seemed to look back. Pencils from FF #75 (June 1968), page 6. Kirby even used Krackle in water scenes! Characters © Marvel Characters, Inc.
Kirby must have really liked the illusion his abstract little dot designs gave. His Treasury Edition of 2001-a huge book-was filled with page after page of beautifully designed swirls and bursts of Krackling dots. Right to the end of his career, when drawing simple lines would have been so much easier, he was still filling his pictures with Krackle. These dot patterns were never careless or undesigned. Clearly seen on many of his pencil photocopies are boundary lines drawn where he defines where he wants his energy trails to go and where he encloses the dot masses; and always, these designs and trails were used to focus the eye of the reader onto the subject of the panel. They supported that subject with an explosive and energetic environment, but never distracted from it. How does it work? After all, there are no black dots really in space or around naked power. Who knows? Kirby was evidently once asked why he put squiggles on peoples' chins. He said, "I don't know-I just did it once and it looked good," and so into his armory of special penciling effects it went-but people don't really have squiggles on their chins. Perhaps Kirby Krackle is the same. Where did it come from? It seems to me that the origins of this effect must reside in black-&-white photographic imagery somewhere. Around the same time as the Krackle started being used, Kirby started drawing lightning (and many power blasts) in a more realistic 'photographic' manner rather than the 'Shazam' lightning. So he was probably using photo reference. In 1963, the first Quasar was photographed. The image is starkly black-&-white, with a mass of dots delineating the image. There's even an inexplicable black ring in one corner of the image I've seen. We've seen Kirby draw such shapes as that as well in his swirling space-scapes. Since we have seen that the marvelous Kirby Krackle first surfaced in representations of space, perhaps it was a photo such as this that forever change the way he drew such things. Along similar lines is a photo of a hurricane taken from space. Perhaps something like this-looking for all the world like a spiral galaxy and easily drawn in harsh black-&-white-ignited Kirby's imagination one day. From the Reader's Digest Book of Strange Stories/Amazing Facts, 1975 (page 37), the right center image is of Quasar 3C273, the first quasar, discovered in 1963 by Maarten Schmidt. Odds are good Kirby was aware of its existence in the mid-1960s; is it the genesis for Kirby Krackle, which appeared fully formed for the first time in this panel from the Surfer's first appearance in FF #48 (March 1966)? Left image © Marvel Characters, Inc.
For more Earthbound subjects, it seems to me that also here older, high contrast pictures had a big effect on Kirby's imaging. In those photos, many details are lost and all that remains are sharp black shapes. The lack of detail is often very powerful. Heavy black smoke often appears in those photos-again often without the gradations of detailed photography and ripe for Kirby's mind to adapt-and drawing this better than most others was already part of Kirby's box of tricks. It's not too big a jump to see how Kirby, seeing that his Krackle energized his space scenes, grafted that new concept onto a form of the older one and was delighted with the result. If his Universe now looked explosively energetic, why not use the same tactic for the representation of the power of his super-characters? Kirby Krackle was here to stay. Much earlier, Roy Crane made a little invention. He worked out that by making words in comic panels bigger or smaller or open for color or angled or shaky and the like that things like whispering, shouting, fear, anger and sound effects worked much better. Now, his approach is taken for granted, as though it is obvious. Kirby Krackle is similar. People who have never heard of Jack Kirby use a form of Kirby Krackle. But until 1966, there was no such thing. And it was Kirby who found it. Sign up here to receive periodic updates about what's going on in the world of TwoMorrows Publishing. All characters are trademarks of their respective companies. All artwork © Jack Kirby unless otherwise noted. All editorial matter is © the respective authors. Jack Kirby Collector ©1994-2003 TwoMorrows. Website © 1995-2003 TwoMorrows Publishing.